For years, I have applied to participate in various medical studies and test groups, only to be rejected. That all changed earlier this year when my wife informed me of a study that would be conducted by Wake Forest University and the US Army. Area runners were solicited to take part in a 12 month process which would attempt to find a more direct correlation between behavior, and/or bio-mechanics, and running injuries. I submitted my information immediately and I was selected! 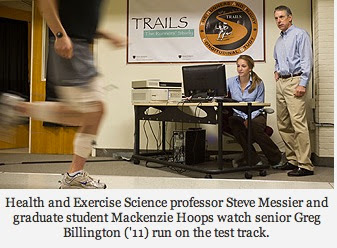 The following link: TRAILS Study WFU Running Research provides a great overview of the process and some insight on the Army's interest in these results. I think you will find it as interesting as I did. Fast forward to earlier this week as I began my 12 month evaluation with a session on flexibility and strength. It was awesome. Tests, photos, pokes and prods. Really awesome. But even better will be session #2 in three weeks. Like the photo shown below, I will be fitted with various sensors while various imagery techniques will evaluate my gait, balance, impact mechanics, and more. There is a video clip in the article that shows what this will look like, (well, what it should look like from someone that has good technique). Following these first test sessions, I will maintain a weekly online journal for the next year, with visits to the lab at 6 and 12 months. I hope to remain injury-free throughout the remainder of marathon training and then into 2012, but if something were to happen, the really great part is that WFU provides care for any running related injuries that might occur. And to think, I could have been accepted into a study that required I eat an onion twice daily. Or maybe even a series of iron level tests for those with more hair on their face than on their head. Yes, patience in my pursuit of becoming a Guinea Pig has definitely paid off. I'll see you in the lab!